This one is strictly for fun. It seems there are a lot of folks, young and old, who would like to see themselves in a beard without the maintenance or the mess beards create related to eating. 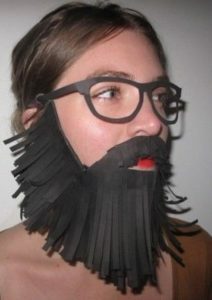 Google “paper beards – images” and you will come up with hundreds of silly (and some sophisticated) designs, most of which you could easily make. 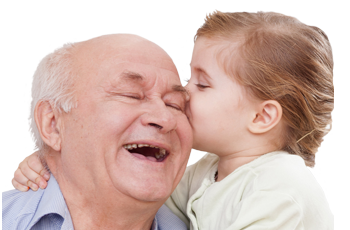 They often come with templates and instructions and have great potential for intergenerational projects. 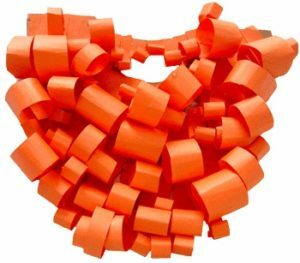 Most are made with simple materials – construction paper and glue — and secured with an elastic band. But any of the illustrated beards here could also easily be glued to a popsicle stick or paint-stirrer and simply held to one’s face. 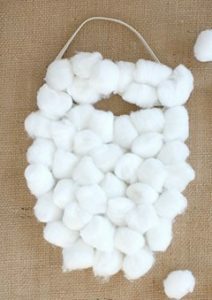 As I write this, Santa Claus will soon be coming to town; the classic kid-made Santa beard is made from cotton balls glued to a white or butcher paper outline, but the curly orange beard shown here that is meant for a leprechaun, could as easily be created in white for Santa. Detailed directions for making it are provided here. The Leprechaun version could also be made in black with strips curled or straight for any occasion that requires a villainous look. And if a beard can be orange, why not pink or blue or another fun color? If you put it on a stick, you can fit it into a template outline as elaborate or outlandish as you can imagine. 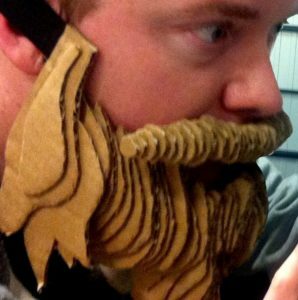 The odd cardboard beard shown here, if you are moved to make it, comes with instructions provided in a cheesy video that begins with a musical ode to beards. Finally, since Christmas is coming, we thought you would enjoy these decorated real beards. That’s the spirit, guys. Have you ever grown a beard or wanted to? If you’ve grown a beard, do you still have it? If you don’t, what made you shave it? 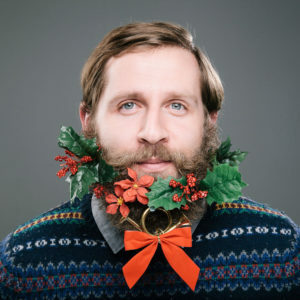 If you have a beard, have you ever thought of decorating it for the holidays? 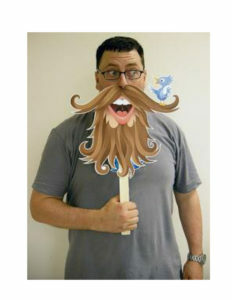 If you were to make your own paper beard, which, if any, of those above appeal to you? Do you have any better ideas? Posted in Improv Art and tagged decorated beards, holiday beards, Improv Art, paper beards, quirky art.